New Year’s Eve. Been awhile since I’ve journaled hard copy with pen in hand. Not sure how long this will last. So, what is it that I need write down here? I have no idea. I have no idea what brings me here – pen to paper. I write in the dark with [my husband] beside me asleep and [my son] down the hall. I use a small hand-held reading light. Not sure if I am doing anything of value now. But at least these are MY words. I am not simply sharing someone else’s words, someone else’s message. Perhaps that is something that I must do, for when I read [someone else’s writing] I was struck by how amateurishly it was written. I know that I can write better. [Forgive me for my arrogance, but I was journaling, after all.] I like my writing voice – when I unleash it. So, that I must. My voice is not corporate – the materials I quote, though, are. So I feel this push to share, to comment, to inform. It takes up all of my time. I’m doing it again – work – what I do when I work – I subsume my own needs, quiet my own voice, ignore my own needs – for the needs of the whole. Wouldn’t it be wonderful if I could instead develop MY voice. Focus on my writing. Perhaps it is time to read, follow & comment less. Perhaps it is time to blog more. To speak. To write. To focus. I was inspired last night to journal by Kelly‘s post Graceless where she writes about journaling. I have spent much of my spare time journaling in a composition book, rather than blogging (sorry guys). It’s allowed me to write freely and not worry about sentence structure, flow or even worrying about what it says or who it could offend. It’s been incredibly helpful to me in trying to work out my feelings about my personal life and who I am and what makes ME happy. It’s almost meditative at times, me scratching across the page, full-throttle, just trying to throw all the thoughts down on the page before they fly away. One benefit in particular that I’ve found about journaling is how it can keep you accountable for your emotions. What I mean is that once you put pen to paper it’s out. It can be crossed out, (hell, it can even be ripped out of the journal and lit on fire) but the point is that it’s out into the universe, and not on your shoulders as much. You can take a deep breath and look back on your scribbles and try to understand how you’re feeling, and try to figure out what to do with those emotions. This morning, I read Natasha Tracy‘s post Pressure and the Limited Time, Resources of One with Bipolar, which resonated a similar message. I think that people have no idea what kind of pressure is exerted when people contact you every day for something. Strangers that expect me to fix their lives and an uncountable number of people who are suicidal. Well, just for the record, I don’t fix people’s lives. I don’t have that power. And I am not a suicide hotline. Natasha, thank you. I feel much the same way, but I err, by far, on the side of doing WAY TOO MUCH for others. Following too many blogs. Reading too many posts. Commenting far too much. I must develop better boundaries. I must learn to say NO. No need to read this, or to respond. The problem with blogging about mental illness is that one has to be extra careful of the message, because there are people who will follow it as an advice. For me blogging is just one form of expression. 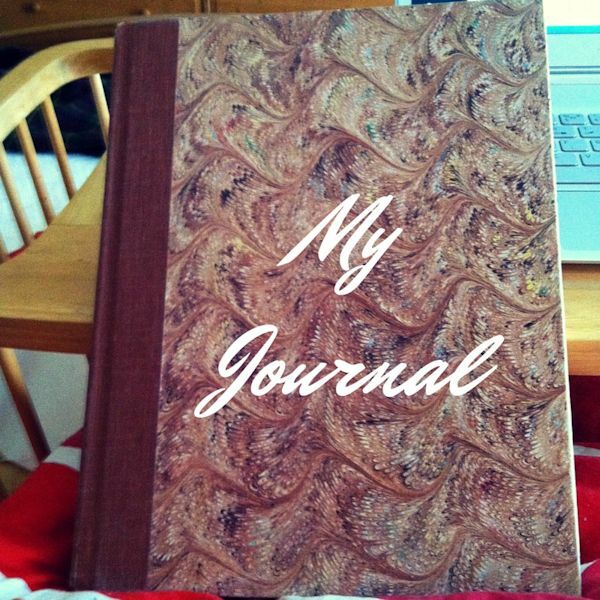 I keep journaling, and fiction writing as a way to let my creativity free from self monitoring. True. Guess it is time to write a disclaimer! Maybe I’ll even write fiction some day. Then, maybe not. Journal writing has been freeing. Have only done it a couple of days now. Last May, my first therapist’s internship ended. She gave me a blank journal (and a book – one of my top reads of the year) when she left. Inside I felt guilt, knowing that I would never keep up with the journal. Much to my surprise, I did! I’ve written something for every single day since. Sometimes it’s pages, sometimes it’s only a couple of sentences. On a few occasions I woke up the next morning and scribbled something down, pretending I wrote it the night before. What matters to me is that I have somehow managed to account for every day for almost 8 months. Brava! Glad to hear that journaling has helped you. When I was a therapist to teen girls in residential treatment, I gave journals as presents. To the more verbal girls, I would give lined journals so that they could write. To the less verbal, I would give unlined journals so that they could chose to either write or draw. Journaling is very therapeutic. I’m very selective about the blogs i follow. Therefore i don’t have trouble keeping up on them because there aren’t all that many. I’m constantly adding blogs I follow and then selecting which of those I have emailed to me. It makes sense to be selective, but I feel an obligation to hit follow on those who follow me. Kind of like Twitter etiquette. It can be quite overwhelming. Once again, you are wise – this time wise in your decision to be selective and protect your time, energy and focus. You can do it, too. I know you can! That, then, shall be my new year’s resolution: to be selective and protect my time, energy and focus. Yep, boundaries are good Kitt. We blog for different reasons and these reasons can be continually changing and so we adapt to what suits our needs best at that point in time. Good luck with it all. Precisely. Happy New Year once again, Glenn. May 2015 be as good a year for you as 2014. Your recovery is inspiring. Tuesday I determined that I was going to start journaling by hand. Yesterday I said naaah I’m gonng type it. Today I said nahhh again lol. For one thing, by hand is hard for me, my penmanship is horrible and it bothers my hand. Typing it out OR writing by hand means I am going to leave evidence of a very sick and twisted mind, lol… This summer I spent hours shredding old journals because I didn’t want people reading what I’d written there – too real. Even in my blogging I can’t be that honest. I very much regret having tossed out ancient journals and essays. Oh, well. My penmanship is horrid. I often have no idea what I’ve written. But my laptop would keep my husband awake. Somehow I managed to write with pen to paper and a little book light without bothering him. Do not know if I’ll be able to keep it up. I took a look at my stats last night – a steady climb as my first year in blogging got underway – I devoted most of my spare time to writing, reading, and commenting. Then in August, my activity dropped by half. I needed the luxury of retreat. I gave myself permission to engage less. I think, if I am to judge by what others’ have said, it is a typical blogging cycle – blog like crazy and then rest and recover. I wish you well in 2015. Cyclical just as nature is and just as my brain works. Sometimes our voice, our message gets lost in how we are trying to help other people. That’s why you comment, share and like so much. You care about people, you want to help them and that’s admirable. Thank you, Becca. Sometimes, though, I help others, but do not take adequate care of myself or even of my own family. Odd that you would say that. My Hubs is always telling me to read my own book and follow my own advice. I too find myself taking care of everyone else and ignoring my own needs.